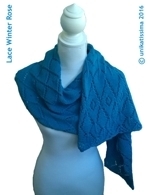 This year you find here on the 24 days of Advent the instructions for a shawl that is symmetrically patterned lengthwise. The patterns comprises amongst others net lace, leaf lace and diamond lace parts which I combined to a harmonious pattern. 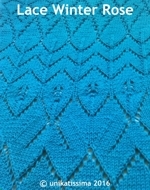 The repeat of 24 stitches allows you to decide on the width of your shawl by simply knitting more or less repeats. 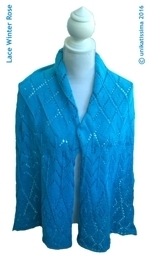 You can also adapt the length because there will be a lengthening pattern in the middle for you to lengthen the shawl should you like to. On day 12 you will learn more about this. 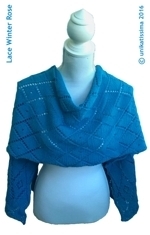 The photo gives you an idea about your shawl (hopefully ;-)) without spoiling the surprise. 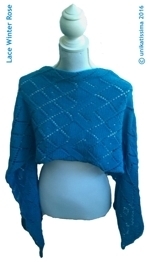 Note: at ravelry you can find the group unikatissima where you can discuss this pattern and my other patterns, too and where you can show us your wip (work in progress). You can register at ravelry with your username and a valid email address only, with all other information about you it's up to you whether you give them (at least it was like this when I registered ;-)). 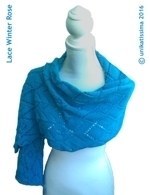 a lengthening pattern that you can knit in the middle of the shawl as often as you like to adapt the length of the shawl to your liking. 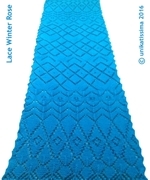 You will learn more about this on day 12.
has total 434 rows without lengthening patterns. 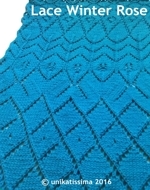 The lengthening pattern has 24 rows and will be knitted after day 12 if necessary. You will learn more about this on day 12. The daily instructions contain each as well charts as written instructions. if you like stitch markers to mark the repeats. This year I knitted only one shawl. got a shawl of about 15,7" x 63" (this are about 40 x 160 cm). I knitted the daily pattern parts in a little bit more than 30 min. 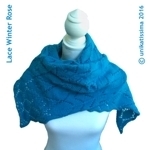 You do not have to register or the like for unikatissima's Lace Knitter's Advent Calendar 2016: starting with December 1, 2016 every day a ‘little door’ opens and the instructions for the next part will be unlocked. So you only have to come here every day of December and download the instructions of the respective day. And if you have questions please be patient because there are days when I can come here only once to answer them. On Dec 28, 2016 the corrected file of day 10 has been uploaded. Note: simply click on the desired day to download your daily instruction, see also How it works further up. Some of you may have problems downloading the pattern of day 2. Please empty your cache, then it should work. If you don’t know how to do this, please look in internet for ‘empty cache’, that’s different for every browser. Nina, thank you so much! I am confused. I downloaded files 1 – 9 and they each were titled inside the file as 2016. However, starting with file 10 they are titled inside the file as 2015 and look identical to the files from last year’s advent exercise. Am I doing something wrong or are the links not pointed at the correct files for this year? I tested it for #10 – #15 and each said 2015 and had a different filename (ilex rather than winter rose). Thanks. You must have downloaded the files from last year’s Advent calendar, because file #14 only opened today and file #15 isn’t available yet. Also when I tried to download the files I got the right files. Please try it again on this page and should you have the same problem, please clear your cache. Shouldn’t you know how to, please search for ‘clear cache’ in internet, it is different for every browser. Enjoy yourself and your shawl!